On the eve of the 2014 Frankfurt Book Fair, publishing professionals have gathered at the fairgrounds to participate in new Business Club events, the annual Rights Directors Meeting, and the digitally focused CONTEC conference. Literary agents are doing deals at the famous Frankfurter Hof and Hessischer Hof, and thought leaders in media and book publishing are discussing the future of the industry. 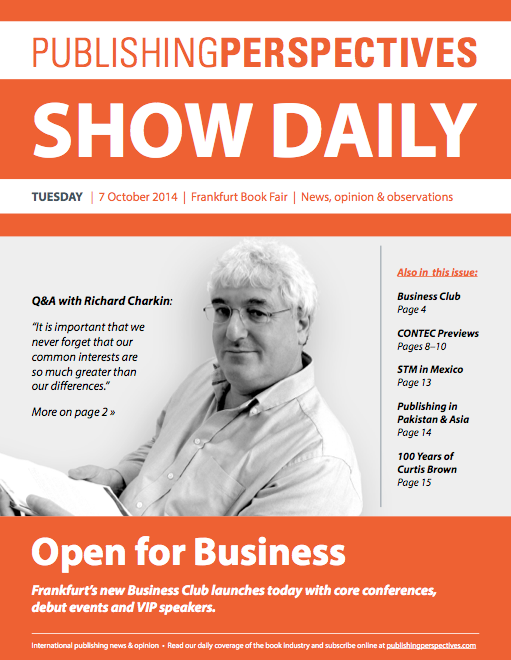 Download Publishing Perspectives‘ Show Daily to find out about what’s happening today in Frankfurt, as well as what VIP speakers have to say about current trends in books, publishing and bookselling.